Hollywood's latest take on the legend of Robin Hood is a fun, glorious mess. Take the plot of Batman Begins and the first season of Arrow, throw in warzone combat scenes right out of Zero Dark Thirty, place most of the movie on the set of Game of Thrones and tonally go for King Arthur: Legend of the Sword's painfully hip grittiness. Blend that all together and you get 2018's Robin Hood. The version of Robin Hood takes its story cues from the classic tale. Young Lord Robin of Loxley (Taron Egerton) is drafted into war to fight the Third Crusades. After years of active combat in the Middle East, Robin suddenly realises the cruelty his fellow crusaders are inflicting on the besieged locals. He protests spectacularly, earning him an arrow in the gut and a one-way ticket back to England. But his actions in standing up for the innocent secures him the friendship and loyalty of his one-time enemy, Moorish commander Yahya, otherwise translated as John (Jamie Foxx), who follows Robin back to England. 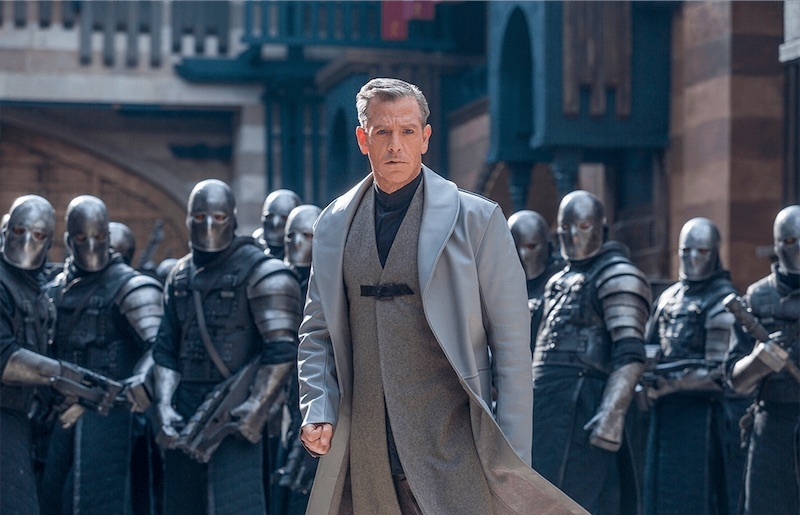 Upon Robin's return, he finds out that he has been declared dead and his manor stripped bare by the Sheriff of Nottingham (Ben Mendelsohn). His lover Marian (Eve Hewson) has mourned him and moved on with local politician Will Tillman (Jamie Dorman). The people of Nottingham are taxed within an inch of their lives and the Sheriff of Nottingham rules with an iron fist. Unable to stomach the injustice, Robin is nudged by Little John into becoming "The Hood", an outlaw vigilante who steals from the rich and gives to the poor. Director Otto Bathurst is a television veteran, having won a BAFTA for his work on Peaky Blinders. However, Robin Hood is his first attempt at a full-length feature film and it shows. The movie has many brilliant moments, but in trying hard to get from lore-dictated point A to point B, many plot elements end up feeling contrived. The warzone opening is a mass of anachronisms. Crusaders wear army fatigue-like uniforms. Soldiers walk around with drawn bows as if they are loaded guns. There is gigantic machine gun crossbow, which is actually historically accurate in concept, but inaccurate in efficiency. Nottingham itself is portrayed as a dystopian slum set next to a foreboding mine and loomed over by a brutalist-style church. The movie tries to weave in commentary on the war on terror, church abuse and fascism, but it never really lands. Some of the movie's choices require a suspension of disbelief. Robin seems to walk off critical injuries more than once. A hood seems to be all Robin needs to shield his secret identity. Little John walks around with no mask while he aids "The Hood," and no one seems to recognise him. Sussing out the logic of certain scenes can be a trying exercise for the viewer, so don't bother. Once you get past all that, there is a rollicking movie underneath. Robin and John's exploits are a joy to behold, with a fantastic training montage scene and brilliantly executed action pieces. 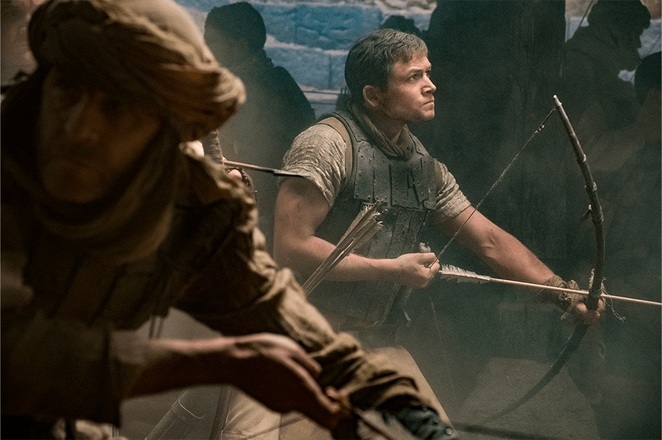 Taron Egerton trained hard to make his archery skills look as real and cool as possible for the camera, and it shows. Then you have the nail-biting tension of Robin playing rich and lordly Lord Loxley to get closer to the Sheriff by day, while secretly opposing the Sheriff as "The Hood" by night. The cinematography of Robin Hood is beautifully done. The CGI is seamless. Action scenes are smooth and visceral. Shots are beautifully framed. Lighting and camera angles are used to great effect in creating the movie's gritty, epic mood. However, this spectacular camera work is often mixed unnecessarily jarring shots, and the end result falls flat. Robin Hood is buoyed by fantastic performances from its cast. 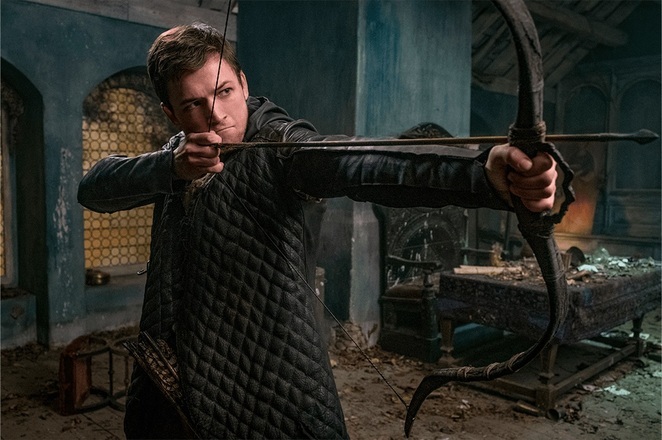 Taron Egerton is charismatic as Robin of Loxley and electrifying as his alter ego, the secret swashbuckling outlaw vigilante ninja archer "The Hood". Egerton has fantastic chemistry with all of the cast, especially with Jamie Foxx's intense and scenery-chewing Little John. 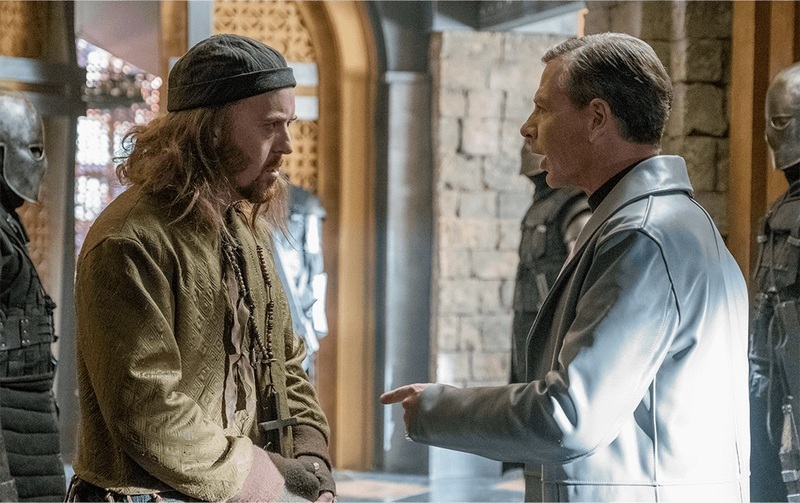 Tim Minchin is delightful as Friar Tuck, who plays the fool to the Sheriff so he can be the rebellion's eyes and ears on the inside. Eve Hewson's Marian plays a strong, feisty woman who works in secret to overthrow her oppressive government, but inevitably ends being mostly eye candy and an unfortunate plot device to motivate the men in her life. Jamie Dornan's character is the weakest of the ensemble, with his Will Tillman playing a wishy-washy local community leader who unconvincingly changes motivations like grass in the wind. The movie does away with the traditional big bad, Prince John, and combines the character with Ben Mendelsohn's tyrant Sheriff of Nottingham. Mendelsohn's performance is the highlight of the movie, and he delivers some of Robin Hood's best lines. Declarations like "God's up there, I'm down here" is pure gold when he snarls it. Here, he plays a much less restrained version of his character from Rogue One and does so with extreme relish. The movie does take its love of one-liners a little too far, and at times, the movie feels like a cluster of quippy one-liners loosely stitched together by the plot. The end credit sequence is even dedicated to rehashing some of the movie's choice lines. Is this movie worth watching? Yes. Faults aside, this is still a ridiculously entertaining movie, perfect for the end of a stressful day where you just want kick back, turn off the brain and have tons of spectacular, swashbuckling fun. Do not go in expecting medieval accuracy at all. 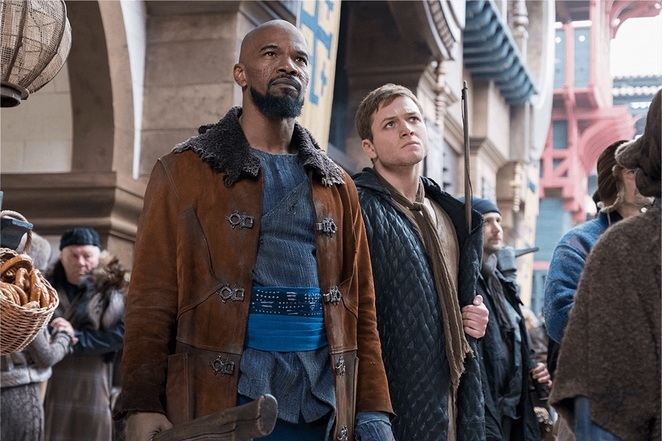 In fact, suspend all disbelief, pretend it's set in an alternate historical dystopia, sit back and enjoy Robin Hood in all its beautiful, messy glory. Robin Hood opens in cinemas November 22. Why? It's a whole lot of glorious, rollicking fun.